When creating anything, the creator’s vision sets the limit of the scale, capabilities, and character of the creation. The creator’s vision drives the architectural and detailed design. This is true for great software just as it is for great buildings. The vision behind EnterpriseSMS® was and is far reaching and unfettered with responsibilities to existing equipment. It is a vision of a software tool box that interconnects any type of device or application using any protocol at any location with one or more devices or applications located anywhere. It is to be capable of handling all types of data, of processing very large numbers of transactions, of scaling to any size, of being distributed over any network architecture, of being language independent, of being based on a world class advanced database, of integrating to any other application, and of providing all kinds of user interfaces. It was to be a real time system. It was to remain independent of any piece of hardware from any manufacturer or any special computer product. Instead, its mission assumed that it was built from commercial-off-the-shelf (COTS) components. Building a vision requires a system model that provides a foundation for the system architecture and the design. This model classifies the system components in a way that helps clarify the different roles they play in the solution. A simple system model as shown to the right does not limit the capabilities of the resulting software. As an open model for innovation it encourages the development of a powerful solution. 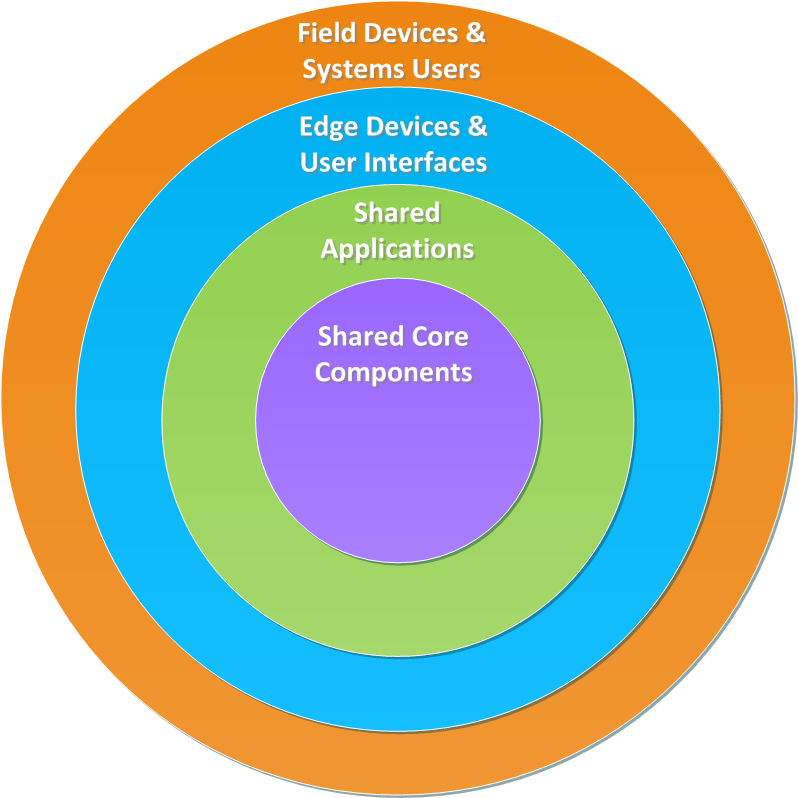 In the context of this layered model, architecture and design will lead to software standards that will be the foundation of the capabilities of the software. Click below to learn more about the layers, architecture, and design and then learn how these standards give EnterpriseSMS® it powerful advantages.